In the summer of 1979, Petersburg funk band Trussel made it to the #23 spot on the Billboard charts with their song, “Love Injection,” an infectious disco groove that became a national hit. 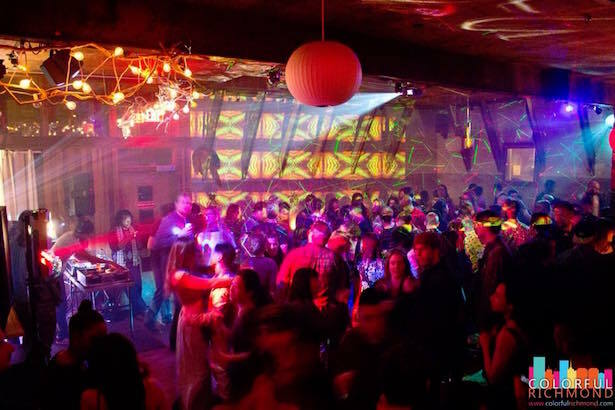 The song was especially popular in gay bars in New York City, like Paradise Garage and The Loft, where pioneering DJ Larry Levan made it a nightclub staple. It was the first song released from their 1980 album of the same name, and Trussel’s first release on major label Elektra records. “Love Injection” showcases the band’s ability to lock in on a disco break and grind it out for eight sweaty minutes. It’s one of the few purely disco numbers that the band recorded in its short-lived existence; the rest of their discography is rooted primarily in the style of 1970s funk and soul. Trussel was formed in 1973 by a cadre of Virginia State University students. The group formed their own record label in 1975 called Bridge the Gap Records, and released their first two singles on the imprint. Their first single, “Bicentennial Boogie,” helped boost their profile regionally. The B-side, “How Many Tricks in 1976,” was a political song that expressed the undercurrent of paranoia in the United States at the time. It was released in the fallout of Watergate, and just after the fall of Saigon, when trust in American politicians was at an all-time low. The band caught a break shortly after the release of their second single. They were tapped to be the backing band for 17-year-old Evelyn ‘Champagne’ King, who would go on to release the disco hit “Shame” in 1977, which reached #9 on the US billboard charts. She would become an even bigger star in the 1980s with her albums I’m in Love and Get Loose. The band performed with her shortly before her breakout in 1977. Trussel was then signed to Elektra in 1978 and released three singles and a full-length record on the label, but declined the label’s offer for a second album. The band had wanted the cover of Love Injection to feature a picture of the band but Elektra refused, opting instead for a drawing of a butterfly and a flower, presumably because the label didn’t want black faces on the cover of the record. This led to a dispute that prompted the band to leave Elektra shortly after the release of Love Injection. Trussel broke up in the early 80s, and “Love Injection” remains their standalone hit, but their legacy as a regional powerhouse lives on today. Their DIY ethic and quality songwriting is strongly representative of the Richmond region’s reputation for producing outstanding musicians. The will to create culture where there is none has been a consistent feature of the area’s arts landscape, and musicians and artists routinely produce high quality work with scarce resources. Almost 40 years later, Trussel remains one of the regions best known exports. Join Area Woman and local resident DJ Olena Summers for a funky get down on a fine Friday night. We’re going to be bringing the disco, funk, international, soul heat to keep your bodies moving. Join us for a cocktail or three or just come say hello! See you there! Richmond-based DJ collective Body Talk has been funking up the local disco scene for almost five years. This weekend, their newest Skyyline event is kicking off at The HofGarden’s rooftop with guest DJs from Baltimore’s 4 Hours of Funk. Body Talk’s funk parties bring the 80s dance party to RVA every last Saturday of the month at Continental Divide. The Skyyline party is set to fill the mid-month gap every second Saturday at The HofGarden throughout the summer and likely into early October. Lovelace joined the crew in 2013 alongside resident DJs Mike Murphy, Mordecai and Tru Blu. All of Body Talk’s DJ’s have been at it for over a decade, and their first party in December of 2012 was put on by DJ Mike Murphy and DJ Mordecai. Body Talk emerged among other DJ crews that have popped up across the country over the last decade. Baltimore’s 4 Hours of Funk just celebrated their 8th anniversary, and have DJ’s Graham and Fleg making the trip down to RVA for this weekend’s Skyyline show. With funk, soul, boogie and disco, the Baltimore shows play on a similar wavelength to Body Talk. The crew was partly influenced by parties along the west coast, Lovelace said, and draws inspiration from crews like San Francisco’s Sweater Funk. Body Talk has also seen guest DJs like the MOdERN CLASS crew from D.C. and Studebaker Hawk from Massachusetts. For their Richmond shows, Lovelace wants folks to remember the parties are organized to be as inclusive and welcoming as possible. When they’re not playing shows for Body Talk, Lovelace and DJ Mike Murphy can be found volunteering at Richmond’s WRIR 97.3 Independent Radio. Catch Lovelace’s show Cosmic Slop Sundays from 11pm-1am and Murphy’s Mellow Madness on Sunday afternoons from 1-3pm. The full list of Body Talk’s guest artists include DJ’s Andrew Morgan, Ben Johnson, Benjamin & Cermakk, Bus Crates 16 Bit Ensemble, Computea Games, Fulani, Mr. Felty, DJ Provoke, Studebaker Hawk, Trev-ski, and live set artists Brian Ellis and Shirt Schwarz. 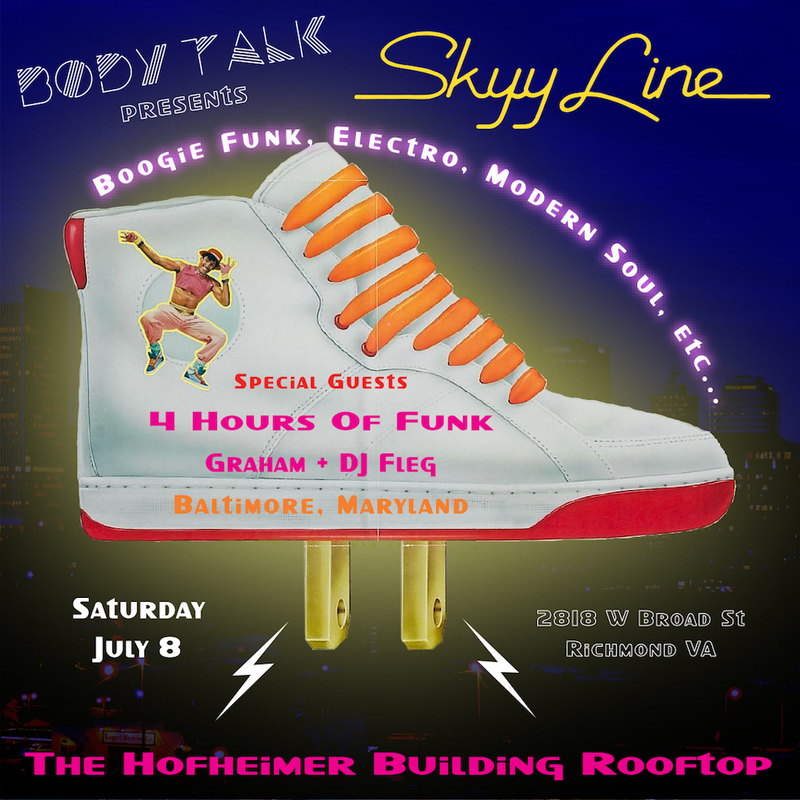 Catch Body Talk, along with 4 Hours of Funk at their Skyyline event at The HofGarden, located at 2818 W. Broad St., Sat., July 8. 8 pm-12 am. Free. Check out Body Talk tunes on Mixcloud, Facebook, Instagram and Tumblr. Toxic Moxie, one of Richmond’s most eclectic bands, is releasing their new album, Episode VI– their third release in two years.